The total revenue of Romanian local budgets has been growing over the past few years, and at the same time the revenue of local authorities in Transylvania have surpassed the country’s average, a study analyzing the 2006–2017 period released by ErdélyStat reveals. The total revenue per capita among Transylvanian local authorities is well above the country’s average, except in the Bucharest–Ilfov region, thanks to the fast growth recorded in the past few years. When looking at the revenue generated by European Union funds, Transylvania is ahead again with 51%, its revenue per capita also well above the country’s average, the statistics show. Local authorities generate revenue from multiple sources, and there are major differences between local and regional authorities in terms of revenue size and composition. When looking at the bigger picture of the revenue of a local budget we see that the biggest chunk comes from the central redistribution of value added tax (36.4%). Income taxes account for 30%, while local taxes (real estate, car taxes, etc.) generate roughly 16%, on average. The rest is made up by state subventions (11%), EU funds (4.2%), and other sources (1.5%). When analyzing the situation in Transylvania, we find that local authorities’ revenue have grown substantially in the past few years. On a national scale, total revenue increased by 15% between 2006–2008 and 2015–2017, while own revenue grew 18%, on average. In Transylvania, ErdélyStat recorded a 20% increase in total revenue, while own revenue grew by 26% for the same period. While it cannot compete with the country’s Bucharest–Ilfov region including the capital, the Transylvanian authorities rank second in terms of revenue per capita for both municipalities and districts. The biggest differences are noticeable at the small district level: Transylvanian districts registered 28% higher revenue per capita between 2015–2017 than their Moldovan counterparts. At the same time, own revenues accounted for 25% of total revenue, which drops to 18% in Moldovan districts. By comparison the country’s average is 23%. Transylvanian districts are the leaders when it comes to EU funds, as well: the revenue generated by successful applications for EU grants surpasses the country’s average by 51%. 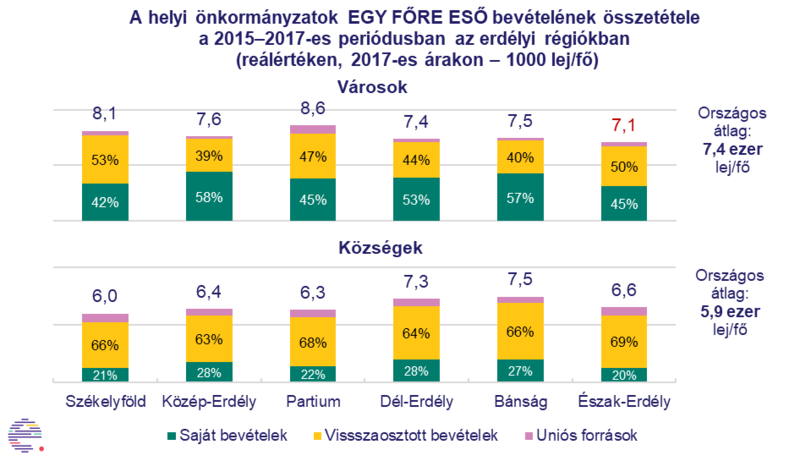 You can read the full report [in Hungarian] by following this link.